Don’t waste another second feeling self-conscious about your smile. Instead, consult with the team at Tampa Surgical Arts to learn about our All-on-4® procedure that will transform your smile and boost your confidence. Our premier oral surgeon, Dr. Manik S. Bedi, is happy to complete this revolutionary procedure at our clinic. If you’ve been considering dental implants for a long time, you’ve most likely heard about the All-on-4® technique. Sometimes, it’s referred to as “teeth in a day” because it’s a procedure that typically doesn’t take longer than a day, allowing you to walk out of our clinic with a brand new smile. This procedure doesn’t involve bone grafts like traditional dental implants. Instead, four implants are placed along the jaw and then a full-arch prosthesis is anchored into them. 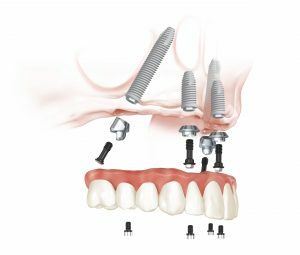 These implants will be permanently fixed into place and the jawbone contoured to an optimal shape, all of which will help to prevent future bone loss in the jaw area. You will be sedated so that you are comfortable throughout the procedure. Any teeth that cannot be restored will be removed. The jawbone will be prepped so that the implants can be inserted. This may include contouring or reconstructive work. The implants will be inserted. 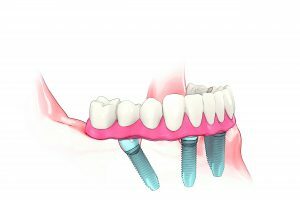 In some instances, up to six implants may need to be placed into the jawbone so that it can properly support the arch. Next, attachments will be inserted into the implants. This is what the prosthetic arch will hook into. Any surrounding tissue will be closed using sutures. Within 10 days, those sutures will dissolve on their own. You will be woken up from surgery so that Dr. Bedi can take impressions of the implants that were just inserted. These impressions will be sent to the lab to create the permanent full-arch prosthesis. You will leave the office with temporary teeth that will eventually be replaced with your permanent prosthesis. It’s the more cost-effective alternative to traditional dental implants. The recovery period is significantly shorter with no uncomfortable bone grafting to worry about. Since All-on-4® preserves your jawbone, your facial structure will remain the same. You’ll be able to eat and drink normally without worrying about your new teeth falling out or becoming damaged. 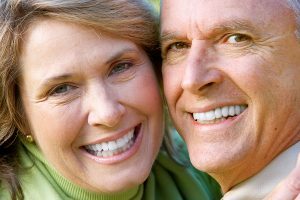 All-on-4® is the ideal procedure for individuals who have missing or broken teeth, or who require rehabilitation in their jawbone due to failing dentition. Individuals who need to replace an entire arch, whether top or bottom, are also great candidates. And, those who have already been wearing full dentures can benefit from this procedure. Additionally, it’s important to have good oral health before undergoing All-on-4®. Those who have experienced gum disease or other conditions that impact oral health are typically not good candidates for this procedure. Since you’ll be under sedation during the procedure, you’ll want to be in good physical health and be a non-smoker. What’s more, if you’ve been told in the past that you do not have enough bone for All-on-4® or traditional dental implants, you can turn to Dr. Bedi for zygomaticus implants. Dr. Bedi is one of the few oral surgeons in the Tampa Bay area qualified to place these implants, and our team would be more than happy to discuss this alternative treatment option with you. When you visit Tampa Surgical Arts to consult about All-on-4®, Dr. Bedi will first determine if you are a candidate for this surgery. A special x-ray will be performed, called a dental cone beam CT scan, that will produce 3-D images of your teeth, jawbone, soft tissues, and more. Impressions will also be taken, as well as a medical history to make sure you are in good health to receive the oral surgery. Once the All-on-4® procedure has been completed, you may experience swelling and bruising around the implant sites. This is completely normal and should resolve within a week. You can take over-the-counter medication to reduce any discomfort. During the first two to four weeks, you’ll be asked to stick to a soft or liquid diet, as this will ensure the implants have time to fully integrate into your jawbone. You’ll also wear a night guard when sleeping. Follow-up appointments will be necessary in the days and weeks following the procedure. This allows us to check in on your progress and ensure the implants are responding successfully. If you want to learn more about how Dr. Bedi at Tampa Surgical Arts can unleash your beauty with the All-on-4® procedure, contact us today to schedule a consultation at our clinic in Dunedin, FL. We serve clients throughout the Tampa Bay area. A friendly, informative and professional staff, each of whom execute their job to the highest standard. Highly recommend this office for any oral surgery needs.